Bahamas Charters for 3 Days, 2 Nights Starting at $1,250.00 Per Person 4 person Occupancy. Aboard Our 61 Viking Custom Sportfish Tournament Ready Vessel. Contact Captain Chase Today 954 925 2020 For Complete Details. The Bahamas offers experiences for boat sailing vacations in the world that are too good to be true. Our 3-day special offer or daily tour, you can rest assured of a holistic experience. Charter your own private yacht and tour the pristine waters of the Bahamas with our expert captains and crew. Our boat from Miami to Bahamas offers an incredible selection of private vessels that take you out on a wonderful trip. At Chase N Dreams, we are very particular about your vacation or school/college/office trip and treat it as our only service. Fishing license, immigration fees, daily dockage and meals, you can leave on us; just enjoy your time on the azure sea. Our Bahamas private boat charter voyage will always bend quite a few rods & will keep you busy all day long. Snapper, Grouper, Wahoo, Blue Marlin, Dorado & Tuna will cause you to smile. 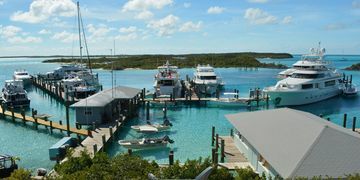 Abacos, located in Northern Bahamas, and just 175 miles to the east of Florida, consists of a bunch of very popular Bahama Islands like Elbow Cay, Guana Cay, Green Turtle Cay, Man of War Cay & the ever-popular Marsh Harbor or Bimini fishing charters. Take a dip, sip a cocktail, eat as much as you want to, snorkel, swim or watch 200 bird species, and leave the rest to us. We will take care of all your needs. Our all-inclusive packages are here to satisfy all your maritime hopes. Contact our team for a Bahamas yacht charter itinerary. The capital of the Bahamas, Nassau, is the starting point of most yachts for charter in the Bahamas and also boasts an international airport. 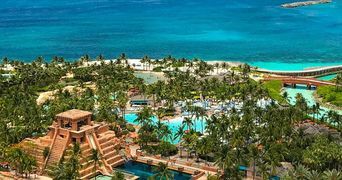 Atlantis Paradise Island is truly the place to get pampered or just reach out and for a Frozen Bahama Mama, one of the island’s favorite drinks.. The perfect marriage of tropical utopia and the attraction of a big city make the place a favorite among travelers. One of the best beaches of the Bahamas, Pink Sands Beach, is the way to go. Protected by a coral reef, which gives you a protected barrier to swim, snorkel or scuba; no wonder it lures thousands of tourists every year. The pale pink shade of the sand caused by the remains of the Foraminifera insects, mixing with the sand, is a sight to behold. Walk barefoot on the ever cool sand and explore the ribbons of the blue water while on a trip on a Bahamas private boat charter. 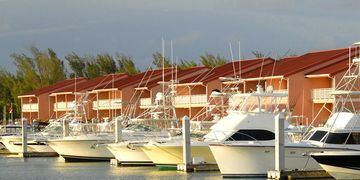 Join us for an extraordinary fishing experience at the marina on a boat from Miami to Bahamas at Compass Cay, located in one of the most protected harbors in the Exumas. Unlike any other charter you have ever boarded, this one is going to sweep you off your feet. We will help you learn some of our fishing techniques to make the entire voyage all the more fun-filled. 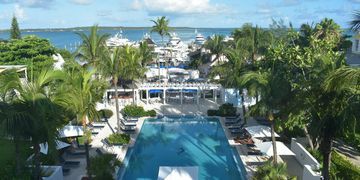 Visit Compass Key today and take home fond memories to last a lifetime. 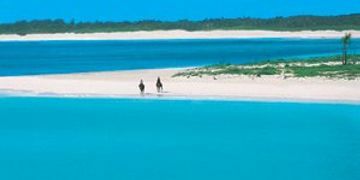 The yachts for charter in the Bahamas take you to Staniel Cay, a paradise. Swim in via the maze of underwater entrances to satiate your eyes to a breathtaking view of sponges, colorful fish, an occasional tortoise, lobster, coral and other marine life. 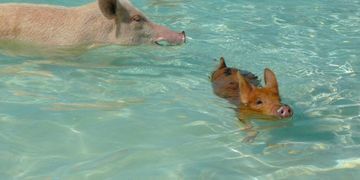 Come to big Major Cay and acquaint yourself to the swimming pigs on the uninhabited island, who actually come out to the Skiff or dingy to Greet You. For details about her Bahamas yacht charter trips and packages, do not hesitate to call us.